In short, home valuation is magic and appraisers are all wizards. Although the workings behind the curtain may be both intimidating and seemingly unpredictable to home buyers and sellers, there is one thing that we can say definitely can affect your home’s value is your school district. A quick twirl around the web turns up a handful of recent surveys and studies that all say essentially the same thing: better schools means your house might be worth more. It’s interesting, though, that at least one study from the Federal Reserve Bank of St. Louis found that schools that were just barely below the average for quality had no influence on the homes where their students lived. These houses were priced based only on their characteristics, like having three bedrooms or a lot the size of a city block. On the other hand, higher-quality school districts increased each home’s price well above what the physical characteristics would have normally indicated. The National Association of Realtors reports that 26 percent of all buyers chose their house based on the school district’s quality. However, among age groups prime to have children in the household, 40 percent of those under 36 years of age considered the school district an influential factor, as did 35 percent of those buyers 37 to 51. The problem with trying to price a home based on less concrete metrics, like school district quality, is that there’s someone else out there that also has an idea what that added value amounts to and may want to fight you for it. This year in the Dallas-Fort Worth, Texas metroplex, for example, homes were frequently being sold for more than their listed price because someone out there had to have that house in that location and right now. But, you can still look at price trends for homes in a very general and national way to get a feel for the influence of school districts. The Washington Post reported on a huge study by Redfin that included 407,000 home sales and almost 11,000 elementary school districts across 57 metropolitan markets. The study’s goal was to determine the average additional value brought to homes by their elementary districts. Surprisingly, top-rated districts brought a whopping $50 per square foot extra when compared to average schools. That’s an extra $100,000 for a 2,000 square foot home!! The effect in California’s hottest markets was even more dramatic, with buyers paying up to $500,000 more for the best districts. When Realtor.com announced its findings from a back to school survey in 2013, a few surprising trends popped up. For example, buyers were more than happy to make major sacrifices in order to get their kids into the right school district. Of the people surveyed and indicated that school boundaries were an important factor in their search (90.53 percent), 42 percent would give up parks and trails, 43.96 would give up a bonus room, 50.6 would give up easy accessible shopping and 62.39 percent could live without a pool or spa. Three out of five buyers said that school boundaries would definitely influence their buying decisions. All of this may sound quite complicated, but at the end of the day, it’s really simple. There are only so many houses in the best school districts, and there are more buyers to buy than sellers to sell. Since school districts are so important to many buyers, things like bidding wars may result, where buyers make above sales price offers, perhaps many of them, until someone is tapped out and a winner is named. Their prize? The house that is now $40k over asking price. It’s a snowball effect, really. Those way-over-asking-price homes end up being comparable homes when the appraiser comes around a few months later, raising the prices of all the homes around them. 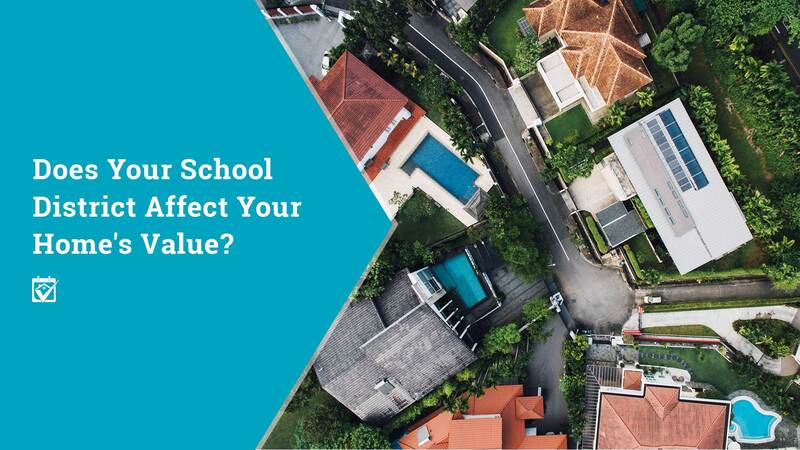 So, in a very real way, it can be said that your school district, provided it’s a good one and not merely average, has a massive impact on your home’s value. Where Can You Go for Advice on Buying or Selling in a Hot School District? Your HomeKeepr community is a wealth of information about all things home ownership. From buying your first house to having a home inspection, getting help with a tax reassessment, or having someone out to repair the gutters, you’ll have your choice of the best home pros in your area. Log in today to find the people who can answer your burning questions or help you navigate a tricky transaction in the school district of your dreams.